Electronic Signatures for Major Purchases, or Not? With on-line security, most concerns about Electronic Signatures have been addressed. Most industries around the globe have been plunging into digital workflow automation with mobile apps and cloud-based or stand alone platforms that utilize electronic signatures for major purchases. They do this to save time while cutting long term costs associated with standard paper practices and procedures. Let’s mention some of the important benefits of utilizing digital platforms and electronic signatures in the workplace. Digital platforms that allow for electronic signatures increase productivity for employees and managers. They save companies a ton on paper, file storage, travel and fuel. Going digital also means receiving more revenue for your business, and at a faster pace because there is a significant response time in between transactions. What does this mean for consumers? Digital transactions help consumers by noticeably decreasing the time it would normally take to approve a major transaction while also disallowing for the typical scanning and faxing numerous times between parties. Arguably, for both consumer and employee, paper-based transactions can often be delayed for weeks at a time because; 1) documents are being lost in inbox’s or regular post, 2) the signatures and/or data often appears eligible due to the amount of times it’s been scanned and sent out via fax or email, 3) consumers don’t always have immediate access to a computer, fax or scanner, and 4) agents normally have multiple deals on the go. Now that the pro’s and con’s have been addressed, let’s get to online security which also plays a major role in digital transactions. Is online security an issue to industry leaders and consumers when it comes to electronic transactions and signatures? Of course it is. The idea that a transaction or signature can be compromised at any given time, whether it be a document penned in ink or an electronic document with an electronic signature, will always be existent with any transaction, big or small. That’s where governing laws come into play. Technology leaders must comply with the International Organization for Standardization’ standards and certifications in taking the extra necessary precautions of insuring oneself against compromising situations. Currently in Real Estate, the electronic commerce act, 2000 does not protect electronic purchase transactions of land or property transfers or the use of electronic signatures to finalize land purchases but in the coming months that will be a thing of the past. Since the amendment to the act has been brought forth several months ago by Prince Hastings MPP Todd Smith and the backing of real estate boards, Realtors want to get into the digital game and toss out the old waste basket called paper. What are your thoughts on using your cursive signature on your cell phones touchscreen to finalize that new home purchase? What are your thoughts? 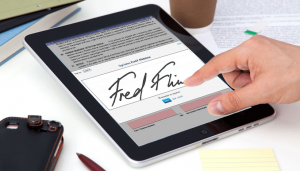 Would you use electronic signatures when buying a home or taking out a mortgage? Categories: Mortgage Technology, Uncategorized | Tags: Digital platforms, digital platforms for electronic signatures, Digital transactions, electronic signature, electronic signatures, Mortgage Technology, on line security, signing documents on-line | Permalink.